pitcher Manny Parra to a 1-year deal. Parra became a free agent when the Brewers didn’t offer him a contract for 2013. Parra was a part of the Brewers bullpen that blew 39 saves and lost 33 games last season. Parra’s 1-year deal is reportedly worth $1-million with incentives that could earn up to $400,000 more. The Milwaukee Brewers filled a void in their bullpen on Thursday by agreeing on a two-year, free agent deal with lefty Tom Gorzellany. The deal depends on Gorzelanny passing a physical. 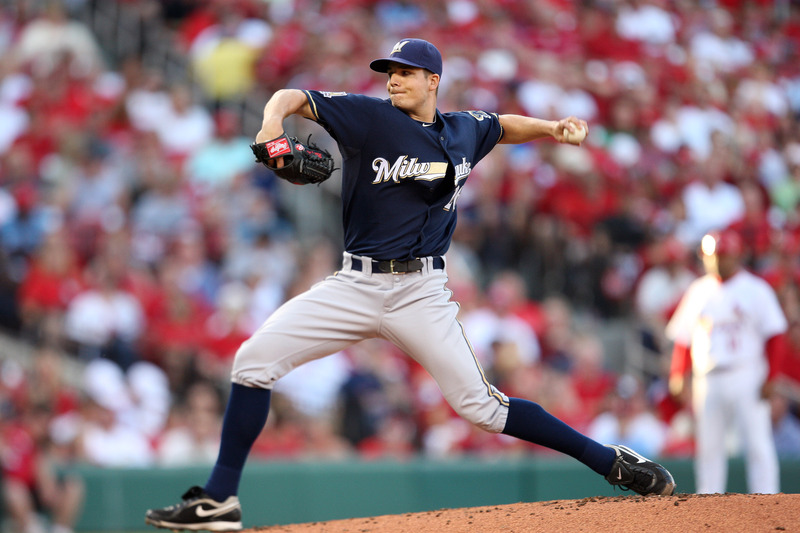 Gorzelanny would become the only left-handed pitcher in the Brewers bullpen after the team decided not to tender Manny Parra a contract in 2013. Gorzelanny made 45 relief appearances with the Nationals in 2012. He went 4-2 with a 2.88 ERA. 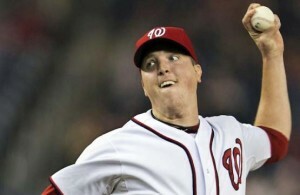 Gorzelanny’s overall record is 44-45 with a 4.41 ERA in 193 games, including 111 starts in seven major league seasons. started Sunday’s game for the Milwaukee Brewers in Houston. Greinke struggled right out of the gate, allowing three first inning runs. He was removed after 3. But five Brewer relievers combined to hold the Astros to 2-hits the rest of the way and Milwaukee rebounded for a 5-3 win. Brewers Closer John Axford was one strike away from notching his 15th save of the season. Instead, Gabby Sanchez connected on a solo home run to tie the game at 6 in the 9th and the Miami Marlins went on to win 7-6 in 10-innings Wednesday at Miller Park. Hanley Ramirez drove in the winning run in the 10th off Manny Parra. The loss is the 9th time in the last 11-loses the bullpen took the loss. things fell apart in the 6th for the Milwaukee Brewers rookie. The Blue Jays clubbed four home runs off of Thornburg in his Major League debut, including back-to-back-to-back long balls in the 6th inning to chase Thornburg. Colby Rasmus, Jose Bautista and Edwin Encarnacion all went long against Thornburg in the sixth. Brett Lawrie got him earlier to account for the four home runs off of Thornburgh. Brewer third baseman Aramis Ramirez got Thornburg off the hook in the bottom of the sixth though, clubbing a grand slam homer to give the Brewers a 9-6 lead. Despite new life, the Brewers bullpen couldn’t hold the lead. Manny Parra gave up a pair of runs and John Axford served up back-to-back homers in the 9th to Colby Rasmus and Jose Bautista to send the Blue Jays to the 10-9 win. For Axford, it was his fourth blown save of the season. The final game of the series is this afternoon. Outfielder Carlos Gomez and left-handed pitcher Manny Parra have both agreed to one year deals with the Milwaukee Brewers. Both avoided salary arbitration. Gomez gets a raise of just over $400,000, up to $1.96-million for next season. Parra gets the same $1.2-million salary that he made last season. Parra missed last season with back and elbow injuries. The Milwaukee Brewers claimed left-handed reliever Daniel Ray Herrera off waivers from Cincinnati to add a reliever to their injury-plagued bullpen. The 26-year-old Herrera pitched the last three seasons with the Reds and was in Triple-A this year. The Brewers assigned him to their Triple-A Nashville affiliate. The Brewers currently have no lefties in their bullpen. Mitch Stetter, Zach Braddock and Manny Parra are all currently out with injuries. 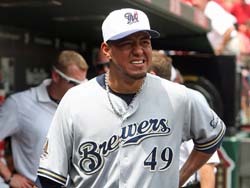 Milwaukee Brewers left-handed reliever Manny Parra will make a rehab appearance with the Wisconsin Timber Rattlers on Saturday against the Kane County Cougars at Fox Cities Stadium in Grand Chute. Parra started the season on the 15-day disabled list with a back injury. 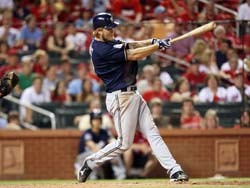 The Brewers also said catcher Jonathan Lucroy will begin a rehab assignment with Class AA Huntsville. Reliever LaTroy Hawkins will start a rehab assignment with Brevard County on Friday. season in Cincinnati against the defending Central Division Champion Reds. The Brewers have had a challenging spring. They’ll start the season with five players on the disabled list, including starting catcher Jonathan Lucroy. The two sides avoided the final year of salary arbitration by agreeing to a $15.5-million contract for the upcoming 2011 season. The salary set a single season record for an arbitration-eligible player.